Stoneflower: Who is Stoneflower Stu? I’ve used the name Stoneflower Studio for more than seventeen years and quite often I am asked where the name comes from. Equally often, it has to be said, people think I must have meant Sunflower and just call me that instead: amusing when written on an envelope, less funny when written on a cheque. On one memorable occasion, the advertising editor of a local magazine decided I had made a mistake when submitting copy and so helpfully corrected the text to read ‘Sunflower Studio’. To reassure me that it was really no bother she kindly added an image of sunflowers to the background of the ad too. I think she was quite hurt that I didn’t appreciate her efforts. So anyway how did I start using this name? In 1997 our brand new house was being built, along with several others, on disused industrial land between existing houses. When our neighbours’ properties had been built several decades earlier, the planners had shown a distinct lack of foresight and imagination (or indeed planning, which was their job) and failed to hold back any spare house numbers, so now we would have to be 25a, alongside 25b, 25c, 27a and 27b as well as the original 25 and 27. We anticipated trouble, mis-delivered post and unordered pizzas* so those of us watching our new houses being built decided we needed house names too. After much deliberation I had the stroke of genius which was ‘Stoneflower’. It was so right! It was so perfect! 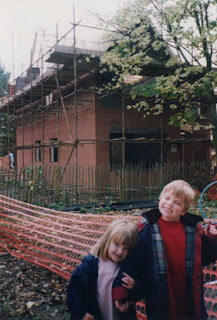 But just as we were about to order a sign and notify Royal Mail and the Fire Service, our children deployed the downcast lashes and small voices tactic and murmured that they’d always liked the name of our old house [insert heart tugging sigh here]. Instant parental deflation was piled onto the guilt already felt at uprooting our six and four year olds from their home 200 miles away and thus the old name, 'Alderley', was duly re-used. What a shame we'd left the house sign behind. But I still haven’t explained about ‘Stoneflower’. Well it comes from the names of our children – yes that’s right, the ungrateful ones who spurned my suggestion of immortalising them in a slate plaque on the front of the house. Our son is Peter, which I’m sure you know comes from the Ancient Greek ‘Petros’ meaning stone. Our daughter is Poppy, which should not require any explanation for the flower bit. Having come up with such a wonderful, meaningful name (even if this view was not shared by the children), I didn’t want it to go to waste so decided to use it as my business name. I have since discovered Stoneflower Studio won’t quite fit on my bank card where the embossing reads STONEFLOWER STU. I rather like the sound of Stoneflower Stu. He sounds cool. I imagine him as a banjo player supporting Seasick Steve on tour. When I joined Twitter I considered becoming StoneflowerStu but settled for @stoneflowerjane. Perhaps I should give Stoneflower Stu his own account. I wonder what he would tweet about? *By the way we were proved right. And having house names didn’t help after all. I love to hear people's thoughts on this blog, but there may be a short delay before your comment appears publicly. Thanks for your patience. I'm a printmaker and painter living in York in the north of England.